Comments: Luke Skywalker X-wing Pilot was the first official costume-changed character figure. In a way, this figure, which made its debut in the second assortment of figures, was the push that propelled the small metaphoric snowball down the frosty slope thus creating the monolithic orb on which we blissfully play that is Star Wars action figure collecting. 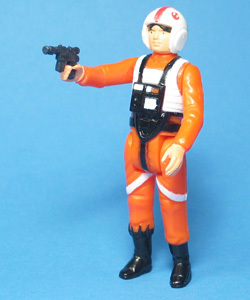 Major Variations: Though all vintage figures have minor variations, Luke Skywalker X-wing Pilot has no major variations.